Ting-Ju Shao presents Alev Siesbye from the Turkey / Denmark and Ken Mihara from Japan. 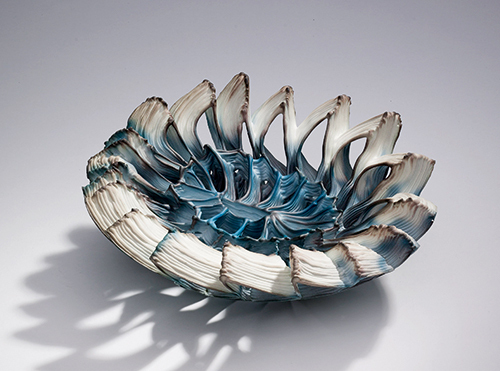 Belgian ceramist Lut Laleman is known for her semi-filigree experiments in porcelain. 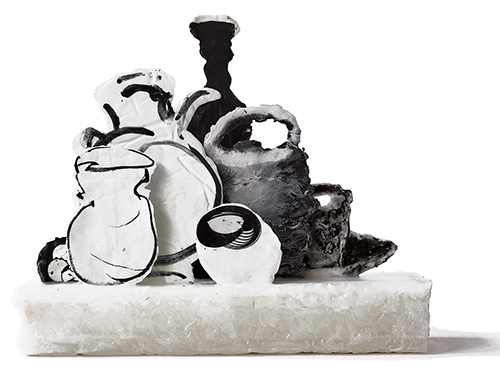 She creates vessels in black and white geometric shapes often seen as inseparable pairs. These two recurrent colours are proof of her constitutive and profound fascination in the possible dualisms that can be obtained via the semi-translucent material. Her unique work is for example an active conveyor, capturer or sheer eraser of both light and shadows. 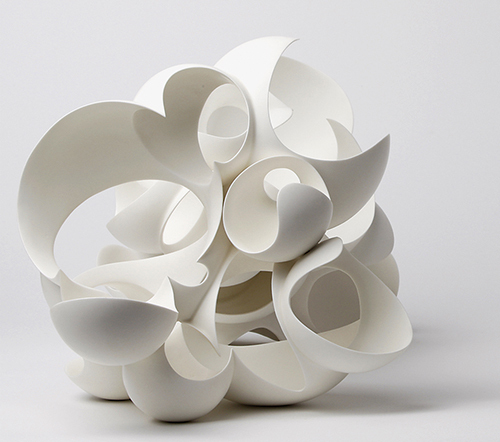 In this way, Laleman’s oeuvre casts a whole new perspective on the wider stories that can be told by porcelain objects. Dualisms and contrasts are at the forefront of Lut Laleman’s work. 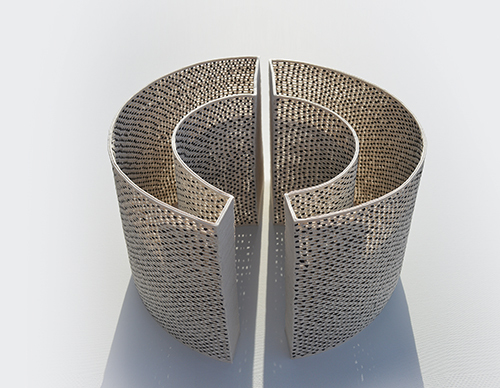 The Belgian ceramist has already worked for more than a decade with the irreconcilability of light and shadow, translucency and opacity, the extremes of black and white, the combination of full material with voids, and the antagonism of mathematical and organic shapes. While doing so, she likes the contrast between two objects, or the dialogue between objects in pairs. The far ends of these co-opposed binary elements are brought together to construct an oeuvre that is abstract and graphic, yet delicate and warm at the same time. Poncé-sur-le-Loir is a village in central France with just four hundred inhabitants. Towering above it is the vast Renaissance château and all around it there are vineyards, vineyards and yet more vineyards. A bucolic setting, especially when the sun is shining. This is where the French ceramist Matthieu Robert lives and works. 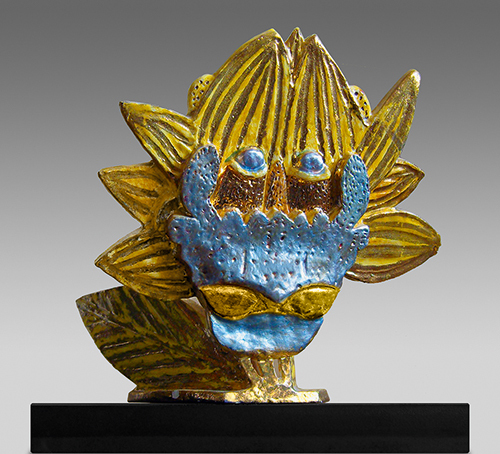 His parents Thierry and Chantal Robert were ceramists before him. In the early 1970s, they had set up a pottery in a former 18th century paper mill, the second attraction in Poncé. Three glass blowers were employed there, one linen weaver, a wrought-iron craftsman, a cabinetmaker and even a hatter. It was in this creative atmosphere that Matthieu Robert grew up (b. 1962). Whereas his parents made traditional local functional ware and folksy decorative ceramics, the pieces that now come from Atelier Robert – Matthieu has now given up the paper mill where he had his first studio – are of the greatest delicacy and refined elegance. They radiate a subtle sense of poetry. 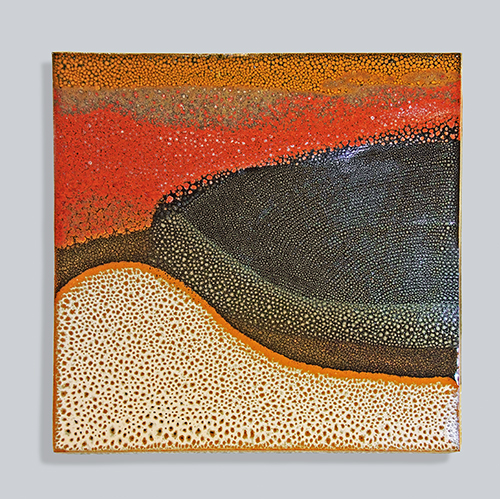 This is in spite of the fact that Matthieu first trained as an industrial ceramist and worked in a Parisian technology centre for roof tiles and bricks. Heraclitus, one of the most influential thinkers in the history of philosophy, saw the world as dynamic, that everything flows. The great law, after which from one primeval energy diversity ceaselessly unfolds is the unity of opposites. This occurs in the interaction of opposing principles which yet keep each other in balance. Harmony is founded on this tension. The famous quotation „panta rhei“ – everything flows – is ascribed to him. This flow is maintained by polar opposites. These opposing forces, which determine the processuality of the world, are a metaphor for my creative work. Even as a child growing up in an artistically inclined family, contact with artists and craftspeople was a formative influence for my life. Besides the encouragement in artistic matters, it was my mother in particular who awakened and developed the creative, craft-orientated side in me. 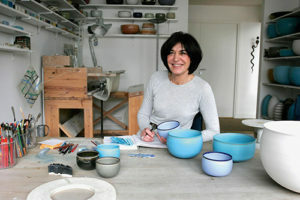 I had my first experience with clay in pottery courses, it awakened my passion and ceramics has never since let me go. Sidsel Hanum’s works relate to the nature that surrounds her and to events from everyday life, both personal stories and political situations. She has chosen porcelain as her material and uses several techniques in producing her works. Through a long and eventful career, Sidsel Hanum (b. 1955) has managed to position herself as one of Norway’s foremost ceramists. She began working professionally in the early 1980s. 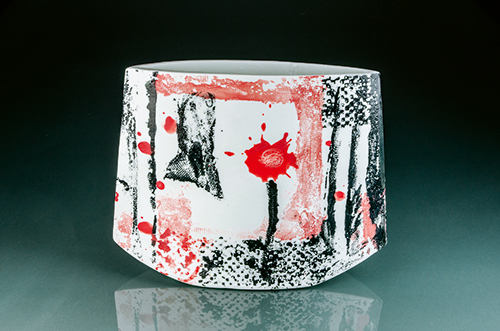 Through continuously researching the possibilities of clay, she has developed and perfected a unique ceramic expression. 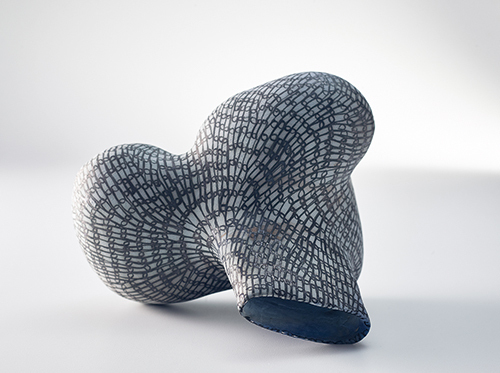 In 2010 her position was further consolidated when she won the Kunsthåndverks-prisen (Craft Prize), the most prestigious accolade a craft artist can receive in Norway. „It is our endeavour to hold on to the spark of light that bursts forth everywhere from life where eternity touches time.“ Thus spoke Friedrich von Schiller two hundred years ago. Since then we have scientifically extended our artistic field of activity, and yet light remains a mystery. For the artist, not only full of admiration but also an effective force. We only know light as something that belongs to our everyday lives without thinking about it. That it has something to do with art is only familiar to us from artistically designed lights and lamps. On 20 December 2013, the UN General Assembly declared 2015 „The International Year of Light and Light-based Technologies“. It was intended to raise awareness of light as an elementary prerequisite for life and as a central component of science and culture. For industry, it was a handy opportunity to promote itself and solicit support for physical research and to gain recruits for science and technology. Nothing that interests us was touched upon. 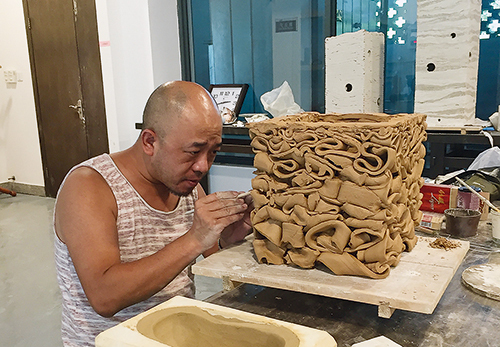 Jimmy had just returned home to Philadelphia; he was the very first artist-in-residence of the Shangyu Celadon Modern International Ceramic Art Center in Shangyu, China. I was one of the artists Jimmy had suggested to Bai Ming, dean of the Ceramics Art and Design Department of Tsinghua University and the artistic director of the Center. In historic times Shangyu was a very important ceramic location, but until very recently no one was aware of this fact, not even in Shangyu. Over the last five years however, archaeologists have discovered about 400 kiln sites in and around the city. These sites date back to the Eastern Han Dynasty (AD 25-220) and prove that Shangyu was the birthplace of porcelain and also the cradle of celadon. 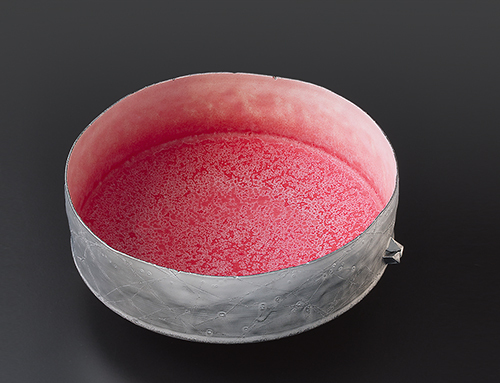 The ancient Shangyu Yue kiln had great impact on other kiln systems, including the Longquan kiln, the RU kiln, the Jingdezhen kiln, and on Korean porcelain. Höhr-Grenzhausen is the centre of a region where since the 14th century salt glazed stoneware has developed and spread all over Europe. In this region there was abundant clay, it was wooded so there was wood for the kilns enough and it was on a major salt route. The invention of the method of salt glazing that originated in this region was of far-reaching consequence. 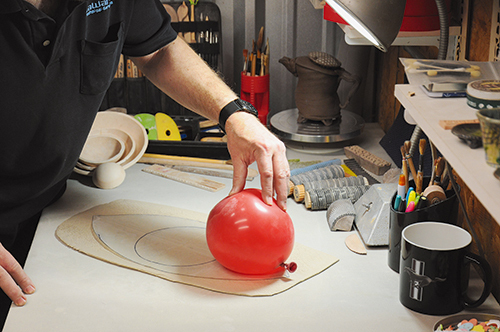 It made the ceramics produced here at once the hardest and most hygienic vessels in Europe. So much for history. Besides the production of ceramics this small city became known for the ceramics training it offered and still does. 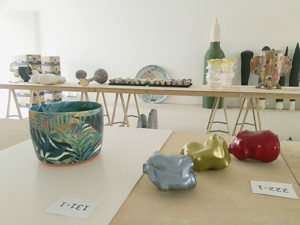 The Fachhochschule für Keramik und Glas offers a world-class quality education. 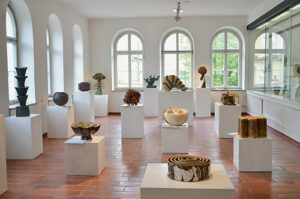 Next to it there is the Ceramics Museum Westerwald, where a quality collection of salt glazed ceramics is to be seen as well as contemporary ceramics, which are shown in the permanent collection and in temporary exhibitions of leading potters and ceramicists from the whole world. In the heart of the Ländchen Glien, a region north of Berlin formed by the Weichselian glaciation, lies the little village of Marwitz, where a former stove factory was home to the Haël-Werkstätten für künstlerische Keramik, run by a Bauhaus graduate Margarete Heymann-Loebenstein (1899 – 1990). Later, in this yellow brick factory, ceramist Hedwig Bollhagen (1907 – 2001) made her „simple, timeless tableware“ from 1934 – 2001. 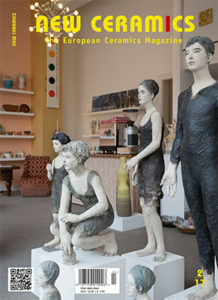 The ceramics she left behind – a collection belonging to the conservation agency, the Deutsche Stiftung Denkmalschutz has been on the national heritage conservation list since 2015. In 2006, HB as she was called with charming brevity by friends, colleagues and companions, was selected by the Goethe Institute as one of the 10 best German designers. Dean Smith was born in 1971, lives and works in Central Victoria, Australia, where the raw post-mining landscape has a strong influence on his work. 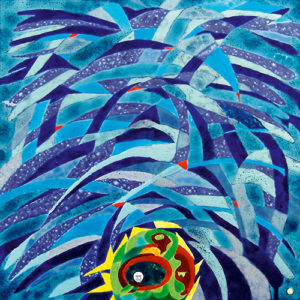 This has given the artist direct access to some of the elements that inspire his work. 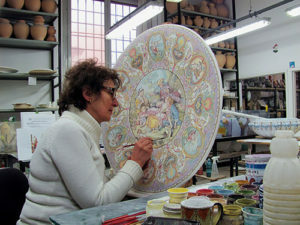 Smith is captivated by the visional effect of jewels and rocks, and transfers the distinguishing characteristics into ceramics. Yoon Sol was born Seoul, South Korea, in 1976. Workshops with Robert are always lively and imaginative. Apart from his neat tool box, he has pouches full of laces, braids, stamps etc. He explains to us in this „In Studio“ talk why texture for him is so important.